As a kid, my favorite writer was Annie M.G. Schmidt (1911 -1955), a dutch writer of amazingly funny and rebellious poems and books for kids. There was nothing condescending or patronizing about her or her works: she truly knew what kids love and what it means to be a kid. I read all of her works and knew them all by heart. But of course, when in school, I had to read more highbrow books (her books are more cabaret-like ) and her works were slightly forgotten. But recently – when I found a book of her poetry- I re-discovered what a great writer she was: no-one could rhyme like her, her colloquial voice is amazing and she can adress heavy subjects in such a light-hearted way, that they make you laugh out loud in spite of yourself. Here is my very favorite poem. I was very happy to find a great english translation of it online, cuz translating a rhyming poem is horribly difficult. This is poor Sebastian S.
He got into an awful mess. to spin a web without delay. Please, Sebastian, don’t be so silly. In wintertime we sleep and hide. No one makes webs when it’s this chilly. and sneak one in behind a blind. Please, Sebastian, don’t make a fuss! It’s much too dangerous inside. There’s danger for the likes of us. This Urge of mine is far too strong. Oh, oh, oh, Sebastian S! An open window – he slipped inside. Stubborn, yes, but walking tall! There goes Sebastian, Urge and all! A murderer was in the room. Sebastian S. just met the broom. 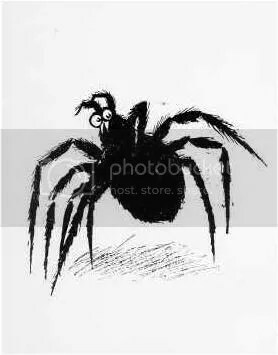 original illustration for “Sebastian Spider” by Wim Bijmoer. Annie M.G. Schmidt. “Sebastian Spider.” 1951. Annie-mg.com. Translation by David Colmer. 2007. 30 May 2008.